Writing great advertising copy seems like a no-brainer. You only have to write a few words, right? But, it's not that easy. Creating ads that both surprise and delight their audience is a lot harder than it looks. 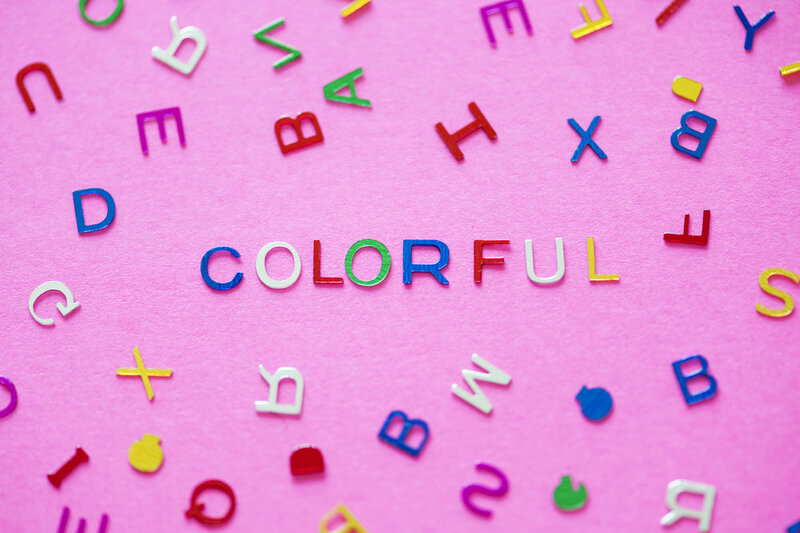 A whole ad campaign could go bust —or viral— based on just a few words, which is why you must choose them wisely. So how do you know what to write and how to write it? Practice, practice, practice. Like any polished skill, writing great ad copy takes practice. Most days when I write, nothing but gibberish comes out. But, every once in a while, I hit a nerve of pure brilliance, which makes all those daily grinds and feelings of self-doubt worth it. I also rely on great writers and minds like Seth Godin, Ryan Holiday, Anne Lamott, and Roy H. Williams to show me how it's done. Not only are they subject matter experts, they are also masters at using language to connect with their readers. I recently finished a book called "The Wizard of Ads" by Roy H. Williams, whose work is known and revered by marketers all over the globe. In his book, he uses the art of storytelling to remind us of several advertising principles that many have forgotten (or ignored) in the pursuit of getting more consumer attention and staying ahead of the competition. What worked decades ago still works today. Here are a few of my favorite passages from Williams' book. I hope they help to stimulate your critical thinking and fuel your creative juices as they did for me! "Who am I, and what am I doing here? is the oldest and perhaps most universal question of humankind.... Our need for definition influences what we drive, where we live, how we furnish our homes, the clothes we wear, the clubs we join, the magazines we read, and the cola we drink. Effective advertising must speak to a felt need.... Most of our purchases involve self-expression, and we tend to buy things with which we identify" (pg. 48). By now, most marketers know one-size-fits-all advertising doesn't work that well. When your message speaks to everyone, it really speaks to no one. Personalized messages that empower, inspire, and resonate with an audience are those that are remembered and shared—much like Always' #LikeAGirl campaign. "You and I have so much to remember that we often forget what we're doing. We are unfortunate victims of over choice: too much to do, too little time.... Most advertisers forget: the customer is seldom paying attention. She simply has too many things to think about. When exposed to your ad, she knows it's there, the same way I know the elevator button is there. The problem is she's not thinking about it. Every beginner's solutions it to put an 'attention getter' into the ad. Bright colors, loud noises, exclamation marks, and crazy stunts are the sad little attention getters most often used. Is this any way to start a romance? To write seductively, you really need to know your audience intimately. Who are they? What do they struggle with? What are their hopes and dreams? What makes them happy or sad? What is their why? Knowing what makes them tick will help you find the right words and phrases that will make the most impact in getting and keeping their attention. "Truth we are told is truth we may not accept; the truth we have realized is the only truth we own." — Roy H. Williams (pg. 35). This is how you separate the average copywriters from the great ones. Great writers are masters at telling the truth in an interesting and though provoking way. "Do you have the courage of your convictions? Are you ready to defend what you say? Or will you pound your chest like King Kong, then run like Peter Cottontail at the first sign of adversity? What do you stand for? Are you willing to stand firm? Your answers to these two questions will determine the power and success of your advertising" (pg. 57). Mean what you say, and say what you mean seems easy enough to do. But, how often do businesses do the complete opposite? They say things they don't believe in and make promises they can't keep. In trying to get the sale, they end up compromising their integrity and losing the trust of their customers. "Predictability. It's what makes advertising sound like advertising, and it's one of the biggest reasons ad campaigns fail. Mouthing meaningless cliches, making unsubstantiated claims, and mindlessly assuming the customer is willing to believe whatever is said are the classic mistakes of advertisers (pg. 60). The human mind discounts the predictable. When you see the punch line coming, the joke is never funny. There can be no curiosity where there is no mystery, no delight without surprise" (pg. 37). You know them: "But Wait! There's More!" or "Make memories that will last a lifetime" or "We go the extra mile." One cliche may or may not sink the ship. But, but in the end, you want results. Make sure your copy is good enough to wake people up and get them to take notice, to remember what you said and how you said it. 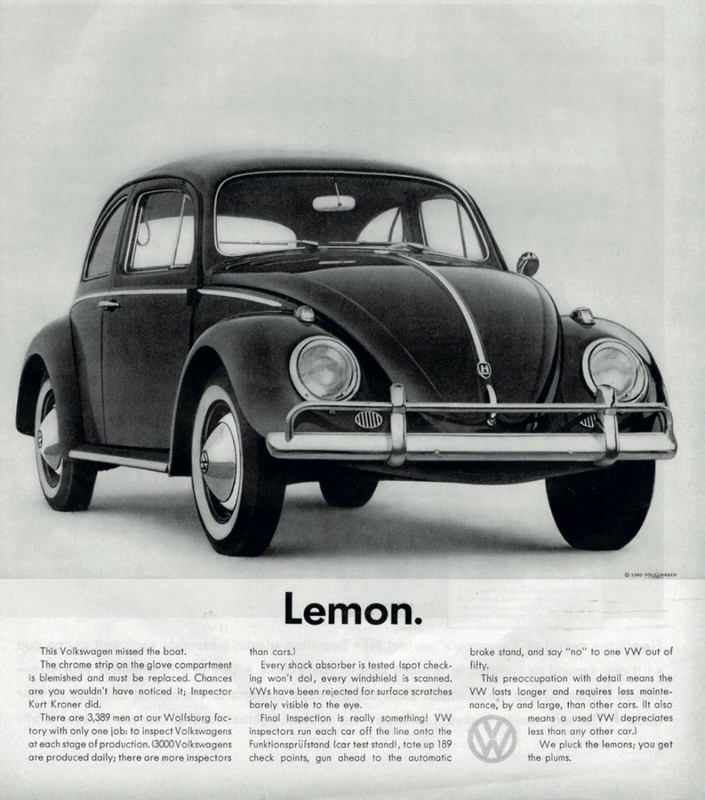 Although Volkswagen's reputation has seen better days, we can still learn a thing or two from them about creating ads that make a big enough splash they are remembered for decades.